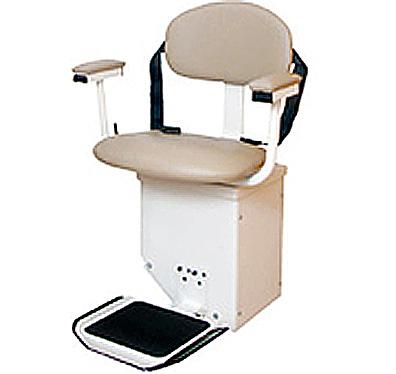 STOP paying upwards of $4000.00 for a company to install a stair lift in your home. Save BIG with our premium selection of Self Installed Stair Lifts! Whether you call it a stairlift, stair lift, or even a stair chair, we have the perfect stairlifts for your self install / d.i.y. needs! 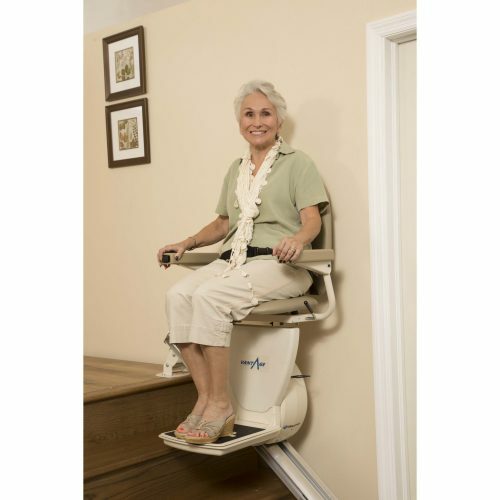 ALL of our Stair Lifts include FREE SHIPPING! We have customers all over the United States that choose to install a stair lift on their own. This D.I.Y. approach is the perfect way to maintain accessibility in your own home. 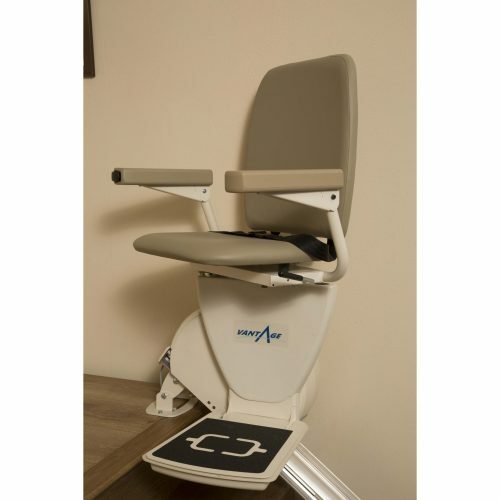 There are stair lifts that we sell like the Summit Stair lift that comes about 90% of the way done before it even reaches your home which makes installation a breeze, however, if you consider yourself to be more mechanically inclined you can take on the challenge of the Vantage Stair Lift which is another great option for self installation. 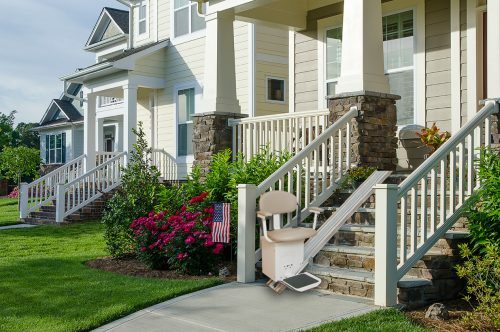 If you are looking for an outdoor stair lift that will assist in getting you in and out of your home, the Outdoor Deluxe Stair Lift would be the perfect solution! It is designed to work well in the elements and is protected to last for years to come. Rounding out the bunch we have our most popular stair lift, the HOME ACCESS PRODUCTS PREMIER STAIR LIFT, which is not only our most economical option, but also our most popular with updated designs and features. We would love to work together with you to make sure that the stair lift you choose will be the best fit for your home. “Will it fit my stairs?” In most cases, your stairs will need to be at least 28″ wide for a user to remain seated as they travel up and down the stairs. For some users, a perch type lift (call for price on this option) will fit a narrower stair case. Besides width, you will want to measure the total length of your staircase. 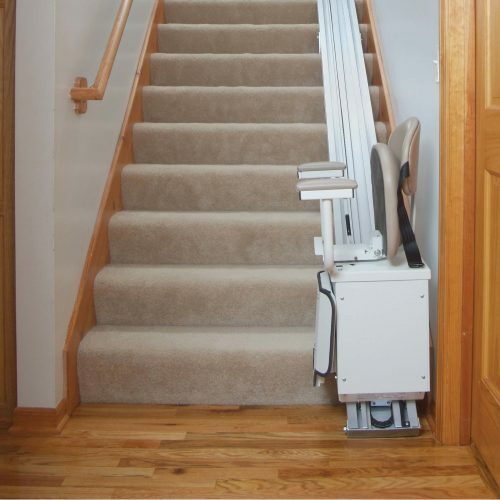 “What side of the steps does it go on?” Whether you are installing your own stair lift or having it installed for you, you want to be sure you have the correct chair lift for your stairs. Standing at the bottom of the steps, decide which side you want to be on. It can go on either side and your hand rails can remain i place. The brackets for the stairlift attach to the floor, not the wall. “Will you come and measure my stairs for me?” We can arrange for someone to measure your stairs, in most parts of the US. There is a charge for this service, depending on the location. Call us for more information. It is very easy for a homeowner to measure the stair himself. “How do I use a stair lift?” A stair lift is not a wheelchair lift. If you are in a wheelchair, you will need to transfer into the stairlift seat. Some of the stair lift seats swivel 90 degrees at the bottom of the staircase, all of the straight lifts swivel at the top. On most lifts, the passenger will ride sideways up the stairs. “Is home stair lift installation available?” Stair lift installation is available in most areas of the US at extra cost. Please call for an estimate on this. Most of the residential stair lifts that we sell are designed for easy installation. Following our written and video guides, a homeowner, relative or friend with a few simple hand tools and 3-4 hours time can perfrom a professional looking stairlift installtion. “A salesman told me I would get fined if I installed my own stair lift” While some local marketing associations have lobbied for and secured legislation to prevent homeowners from installing their own lifts, there does not appear to be any record of an individual being fined, arrested, jailed or harassed for doing so. “What is the weight capacity of this stairlift?” Each model will carry a different amount of weight safely. Check the specifications of each model. Capacities of 250, 300, 375, 400 and 500 pounds are currently available. Call us at 800-514-5774 for more information and to be sure you get the right machine. “Tell me about AC and DC stairway chairs” AC units run off of regular household current. If they are plugged in, and you have electrical power, they are ready to run. They are typically louder than DC models, the tracks on AC lifts tend to take up more space. The AC lift is ideal in situations like churches or offices that may get a lot of use in a short period of time. DC models contain a pair of 12 volt batteries which power the handicap lift as it travels up and down the stairs. When you park the lift at the top or boittom of the stairs, they sit on recharge points. a DC model is much quieter and smoother than an AC model. The DC models usually ride on rack and pinion tracks that are much thinner than their AC counterparts. The DC models also tend to be more attractive and blend in with household decor better. “What if my stairs have a turn?” There are many types of stair case. The majority of stairs are straight, however, some homes do have turns. A true curved stair lift that travels continuously around corners is a custom job. In most urban areas, we have got associates that can visit, consult, sell and install such a lift. Prices on curved lifts generally start at around $9500. Pricing will depend on make, model, the custom specifications and your geographic area. Many of our clients have a stair case which consists of two separate straight runs with a landing in the middle. For these houses, the homeowner has the option of installing two straight lifts. To someone that is investigating this for the first time, the idea of two lifts might seem complicated but in practice it works quite well. Thousands of people have opted for this solution and been satisfied. 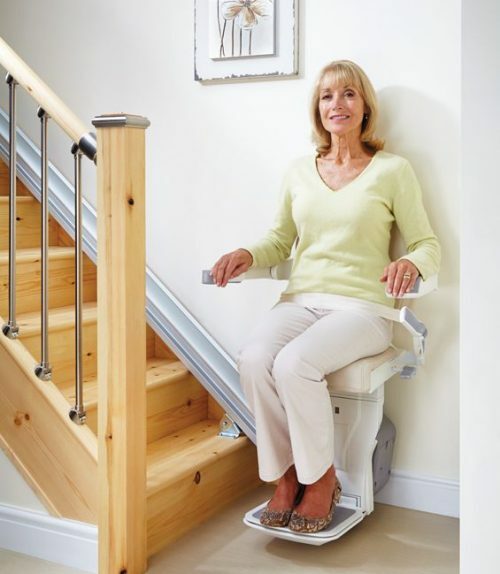 “Will Medicare pay for a stair lift?” Unfortunately, Medicare, which is insurance that is provided by the federal government for elder people, does not cover stair chair lifts. 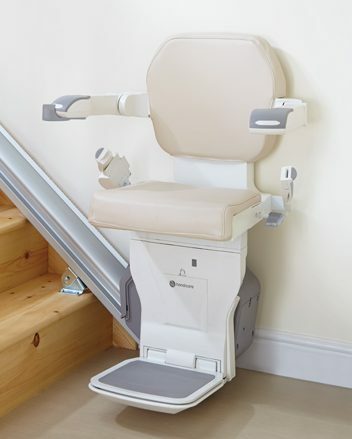 A stair chair lift is classified as a “home modification” by Medicare instead of a “durable medical equipment”. “Do I have to pay for shipping?” Our warehouse is located in Montgomery, Illinois. We ship most of our stairlift products direct from this location via UPS and FedEx. If you prefer to pickup your lift from our warehouse, there will be no shipping charge. 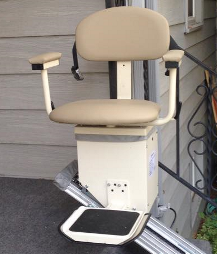 We charge a flat fee of $200 to ship a stairlift to any location in the continental US. Shipping to Alaska and Hawaii is available at extra cost. “Do you charge sales tax?” If we are shipping your lift to any location outside of Illinois, there is no sales tax. “What about stair lift reviews?” Please see the Testimonials page on this web site for comments from a few of our previous clients. “Do you have a measuring guide?” Yes , we do. Please do all measurements in inches. The Bellavita bath tub lift it has been a real blessing as now I am able to take a bath again it was money worth spending thanks for everything.